Feelings and emotional eating are like two peas in a pod. They go together like “rama lama lama ka dinga da dinga dong” (though the two together are not always so joyously poetic). More often, it’s sadness, anxiety, loneliness, and/or depression that lead to emotional eating. 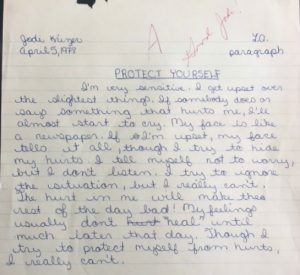 At the age of 11, I was writing about my feelings and how they didn’t heal until hours after the hurt had affected me. That’s a lot of time to allow for emotional eating; a lot of time to try and stuff my feelings with food to feel better. It’s not called “comfort food” for nothing. There’s a good reason for it. Candy, carbs, and ooey-gooey food like mac-n-cheese make us feel better. Our body benefits from a dopamine and serotonin rush. The melancholy disappears (temporarily) and we can function normally again (until the next hurt comes along). But wait…what if we can diminish the hurt? What if we can manage the hurt in a positive way? 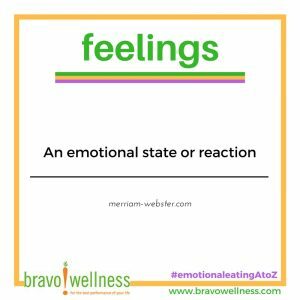 What if we can feel our feelings instead of feed our feelings? Ah…then life would be different. 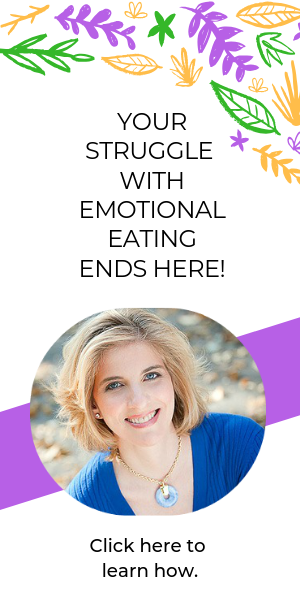 Emotional eating wouldn’t have a hold over us. It’s easy to think this is impossible – that we can never feel our feelings because that would be too painful. Indeed, in the beginning it can be. But, over time, as we allow our bodies and minds to heal, the pain diminishes, not because we don’t have feelings anymore, but because we learn to understand our feelings and handle them with tender loving care. Understanding is key. We have to be able to determine why something – an act, a word or words – makes us feel badly about ourselves. Is there a truth we need to address? Maybe. Okay then, let’s address it; not eat it. Ask yourself: what steps do I need to take to change this? How can I do better next time? Take a deep breath and do what you need to do to move yourself forward – to a stronger, more confident place. It’s also possible that whatever is being directed toward you is, in fact, more about the person causing you the discomfort than you. Ask yourself: Is this really about me? Have I done anything wrong? If the answer is no, you need to do what you can to move away from the negativity and toxicity. You can’t change someone, but you can control how you react to them. Taking the time to process your feelings can help you manage emotional eating. It’s worth the effort to take a step back, consider what’s being said or what is happening around you, and think – before running for the candy, cake and cookies. Always remember that your feelings are yours. Don’t be embarrassed by them. 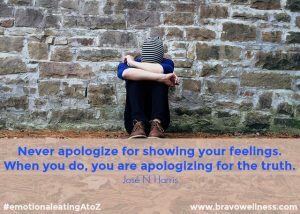 Don’t apologize for them. Your feelings are your truth. Embrace them, understand them and let them help you become the best version of YOU.